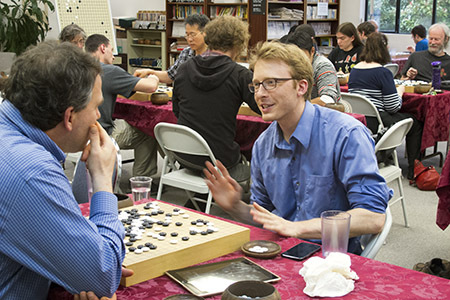 Reigning British Champion Andrew Kay 4d (right) and Alex Kent 3d (below left) will meet in the final of the 2014 British Championship after taking top places at the Challengers’ League, held over the bank holiday weekend, Friday May 24 to Tuesday May 27, at the International Student House in London. The Challengers’ is a round-robin between the eight top players from the first stage of the Championship, the Candidates’ Tournament (see Ge Bei Lead UK Challenger, EJ 5/10), with 105 minutes each main time, and overtime of 15 plays in 5 minutes. Kay won all seven rounds, while Kent won five. Click here for full results. 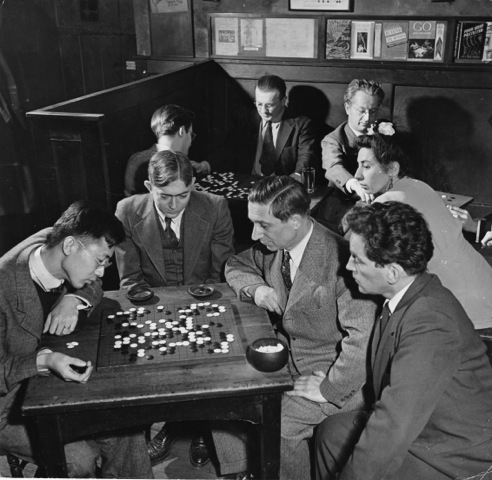 As it transpired, four of those who qualified to contend for a place in the final in fact did not: Sandy Taylor 2d, Tim Hunt 3d and Bruno Poltronieri 3d all found they had other commitments which clashed while, most unfortunate of all, Ge Bei (below right) did not confirm his entry in time. Ge had come first in the Candidates’, beating all his opponents, including reigning champion Kay who had once again waived his right to bypass the first stage of the Championship. 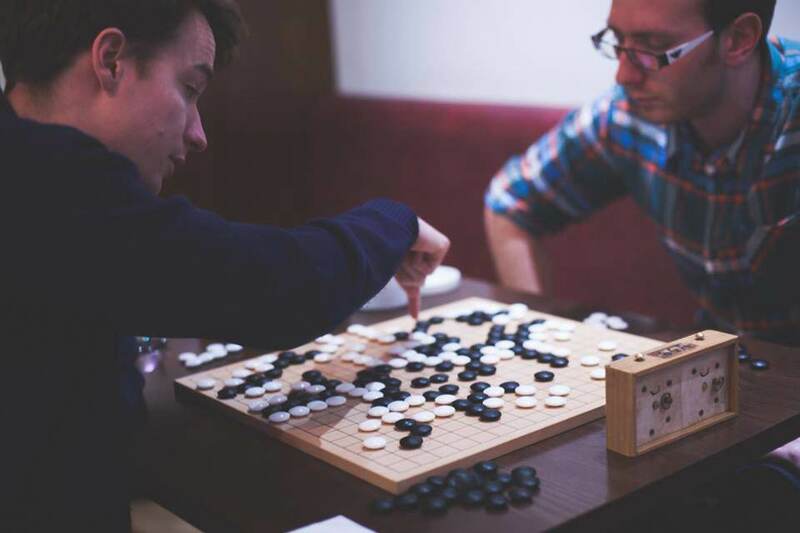 BGA Rules state, “It is the responsibility of the qualified players to determine their eligibility for entry to the Candidates’ Tournament and the Challengers’ League and submit their entries to these events.” At the time of going to press we had been unable to contact Ge for comment. In the circumstances, reserve Alistair Wall 2d was called up along with the next three highly-placed in the Candidates: Alex Rix 3d, Kiyohiko Tanaka 2d and Harry Fearnley 2d. Details of the final are yet to be arranged, but it will be a best-of-three (or five if so agreed between the finalists) with 180 minutes main time each and is likely to be broadcast live on KGS with professional commentary. Report by Tony Collman, British correspondent for the E-Journal. 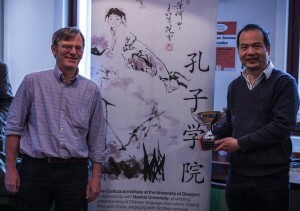 Photos: Andrew Kay celebrates retaining the Championship in 2013; Alex Kent, both courtesy of the BGA website; Ge Bei at the Candidates’, by Tanaka Kiyohiko. - based on Ormerod’s longer report on the GGG site. On his BenGoZen blog, Benjamin Hong recently posted a nice report on his Hong Kong go adventure earlier this year. 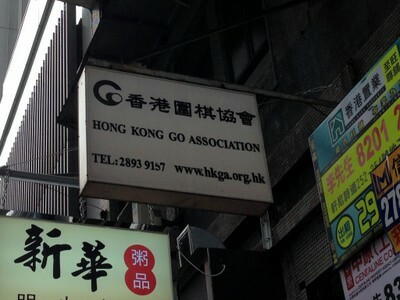 After spotting an ad for go on a bus, Hong was disappointed to discover that the Hong Kong Go Asso­ci­a­tion (HKGA) does not have a go salon where visitors can drop in for a game. “I was pretty bummed to hear that,” Hong, a 2-kyu who lives in the metro Washington area, writes. “After all, would my epic go adven­ture in Hong Kong be reduced to sim­ply vis­it­ing the HKGA and maybe tak­ing a few pic­tures? All hope was nearly gone until the sec­re­tary told my mom that I could take pri­vate lessons if I wanted to.” This launches an adventure across the city that will be familiar to anyone who’s tried to track down go in a foreign country. 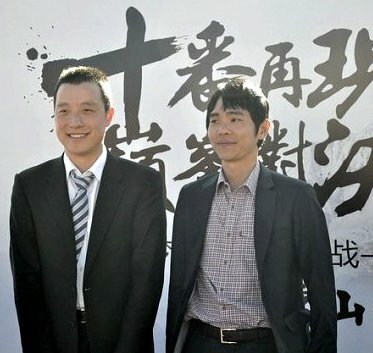 In addition to being entertaining, Hong’s tale has a happy ending and reveals the correct address of the HKGA, including a helpful photo of the sign to look for. Hint, not the one at right. Help determine the direction of play for the American Go Association by joining the AGA Board of Directors. “This is a very exciting time for American go,” says AGA President Andy Okun. “Our new professional system, more local activities and increased participation in major events make input from the American go community more important than ever.” Nominations are now open for four AGA Board seats, including the three regional seats and the At-Large seat. Nominations are being accepted through June 15. Nominations must be sent to elections@usgo.org. Click here for complete election information and qualifications. 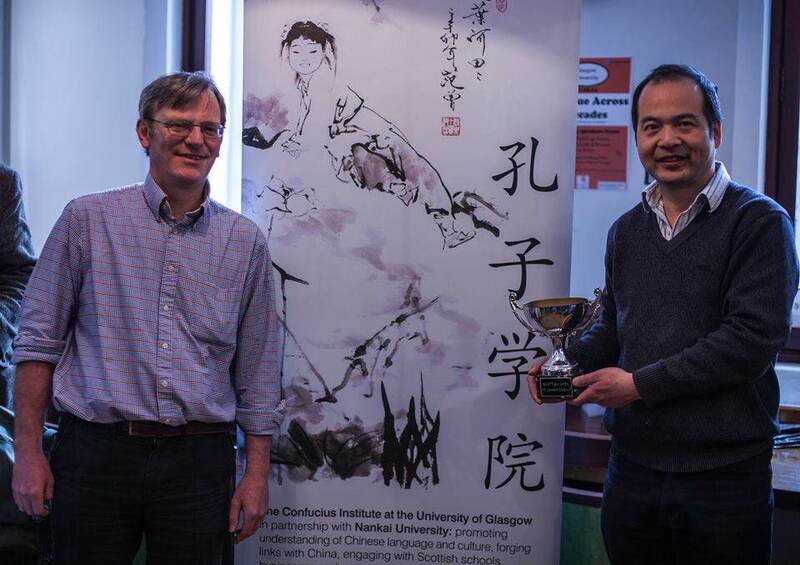 David Lee 3d of Dundee scored a perfect six wins to take the Scottish Open Championship 2014, which ran Sat May 24 to Sun May 25 at the Gilchrist Postgraduate Club, University of Glasgow. Runner-up was Francis Roads 1d of Wanstead with four wins. Bob Scantlebury 8k of Sheffield distinguished himself with five wins and Joseff Thomas 10k of Glasgow and Carel Goodheir 9k of Skye also won four of the six rounds. Twenty-five took part in all, ranging from 3d to 17k. Click here for full results. The tournament benefited for the first time this year from generous sponsorship from the University’s branch of the Confucius Institute, so as well as the Champion receiving a trophy and a pewter quaich (a shallow two-handled drinking cup or bowl), all 14 players on three or more wins selected a book from the British Go Association (BGA) bookstall and everyone took away a bottle of Isle of Skye Go Beer or a box of chocolates. The event was organized on behalf of the BGA by Michael Comerford (venue and sponsorship) and Donald Macleod (tournament direction). The vast majority of you (84%, or 38 out of 45) correctly chose Edward Lasker as the source of the quote “The rules of go are so elegant, organic and rigorously logical that if intelligent life forms exist elsewhere in the universe they almost certainly play go.” Lasker, a leading German-American chess and go player, was instrumental in developing go in the U.S., and together with Karl Davis Robinson and Lee Hartman founded the American Go Association. “It’s not go-related, but Arthur C. Clarke had a fine comment (quoted from memory here),” writes Fred Baldwin. “Either we are alone in the universe or we are not. Each possibility is equally terrifying.” On a cheerier note, Ramon Mercado writes that “I truly enjoyed reading that bit about the Chumley’s speakeasy in NY. 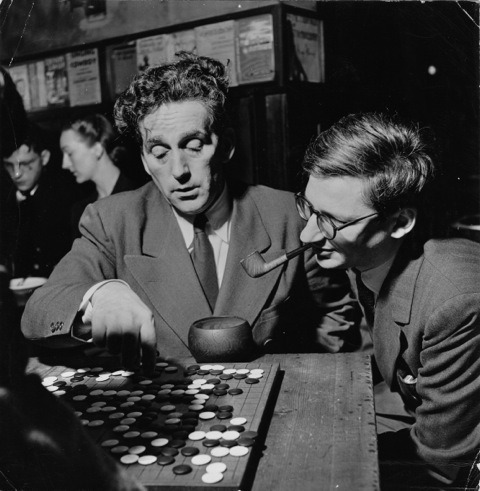 I’ll make sure to have a pint at it next time I’m in NY, if it’s allowed to be opened.” And speaking of Chumley’s, AGA Archivist David Doshay sent along these terrific shots of play at the club, shot for Life magazine in 1940. This Week’s Quiz: The go problem on this year’s US Go Congress logo is from a collection of classic Chinese problems and like most such problems it has a name. Is it: The Warrior Escapes; An Ambush of Five Stones; or A Pearl Emerging from the Sea? Click here to submit your answer. And, for a chance to win $50 off your Congress registration, email your solution to the problem to registrar@gocongress.org before this Sunday, June 1. “Visitors to Seattle should save Tuesdays for the Go Center”, advises Center Manager Brian Allen. “It’s our biggest day.” On Tuesday, May 20, the Center had 47 players visit, including 12 children. New players can find instruction on Tuesday as well. Saturdays are smaller, but usually there are more than 20 visitors at all levels. There are evening classes on Monday, Wednesday and Thursday. Your first ten visits to the Go Center are free, including classes. Visitors are invited to check out the weekly schedule, and the special events calendar. 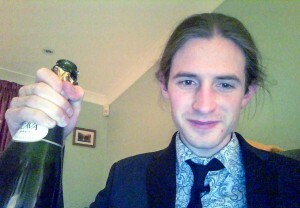 Photo: A Tuesday night in June 2013. - photo/report by Brian Allen.